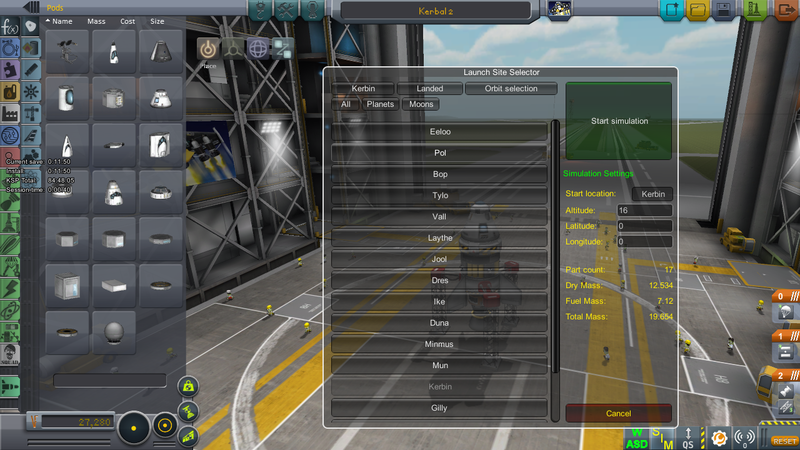 KRASH lets you launch flights from the VAB\SPH, and when the flight is over, it restores the game to the exact state that it was in before the simulation started. It handles restoring the state of any mod which stores its data in the vanilla persistence file (basically any of them worth their salt), and even handles it if you exit the game during a simulation. Starting sim in Orbit There is a row of buttons which will allow you to filter the displayed planetary bodies by either planets, moons, or all. Select the planetary body you want to start the sim at from the displayed list. Also, enter an altitude where the vessel should be started at. Note that when you select a body, the altitude will be automatically adjusted to be just outside the atmosphere if it has one, or at an altitude of 10000m. You can override it with whatever values you want. IMPORTANT NOTE: If you are running RemoteTech, be sure that ALL your antennas are set to start retracted, otherwise they will be ripped off during the teleportation process. At this menu, you can either restart the simulation, or terminate the simulation and return to the editor. 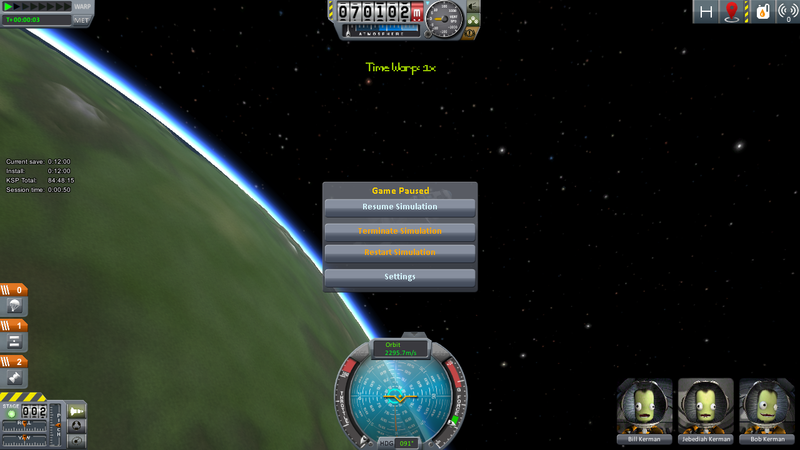 In the event of either a game crash during the simulation, or exiting the program, restarting the game will restore the game to the point just before you started the simulation. When the simulation is terminated, you will see the usual flight history dialog before the final revert. Fixed exploding ships after teleport to landed state Fixed issue where if flight can't be entered due to some reason, simulation mode will be exited. This can happen in the following two (known) scenarios: 1. Try to launch, no kerbals available, cancel launch 2. In career mode, if you try to simulate a vessel for which you haven't researched the parts, the simulation does not start but the game remains in simulation mode. Obviously can happen only if you import a ship design from another save. Added code to ensure that no latitude or longitude of 0.0 will be passed to Unity, this to work around a Unity bug. Config file enhanced with with nodes for each career type. Top of the config file are the basic values, the values in the nodes override the basic values (if present). Thanks for downloading KRASH - Kerbal Ramification Artifical Simulation Hub (simulation mod for KSP)!